Navy took the opening kickoff of the second half and started on their own 25 yard line. The Mids were able to maintain an extended drive lasting over seven minutes. 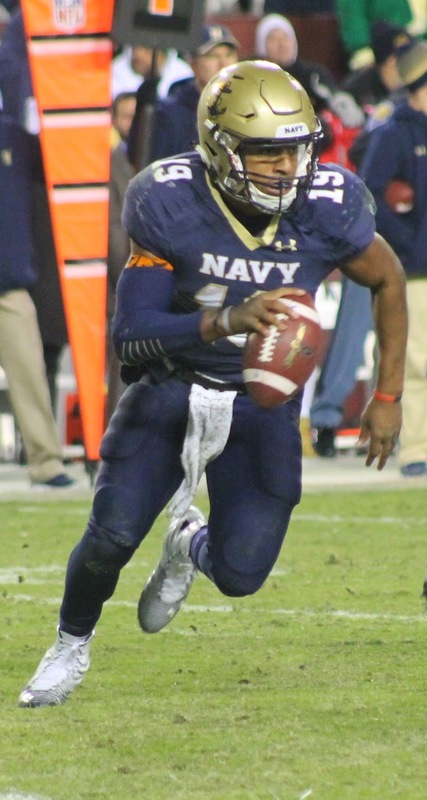 On the drive, Keenan Reynolds moved into fifth place on the Naval Academy all-time rushing list with 2,668 yards, passing Ricky Dobbs. Navy capped off the drive with a 13-yard run by Geoffrey Whiteside. The Mids now trail by just four points. The Mids ran 15 plays on the drive. Navy has amassed 207 rushing yards on 39 carries. This is the most that Notre Dame has given up all season. Navy was able to force Notre Dame to punt on their next drive. The Irish punt was the first against Navy since 2012. Navy was helped on the ND drive by an overturned pass completion and a sack by Obi Uzoma and Bernard Sarra on a third down for a loss of 15 yards. Navy's next drive started on their own 34 yard line. Navy showed their guts and confidence in their offense on a fourth down call on their own 42 yard line. Navy called timeout and decided to go for it. Noah Copeland took a pitch off the left side and raced down the sideline, forced out of bounds at the Notre Dame four yard line. Chris Swain took the next hand off into the endzone giving Navy the lead 31-28.